Have You Tried Cedar Planks for Grilling? If you have not tried cedar planks for grilling, yet, it is time you did. 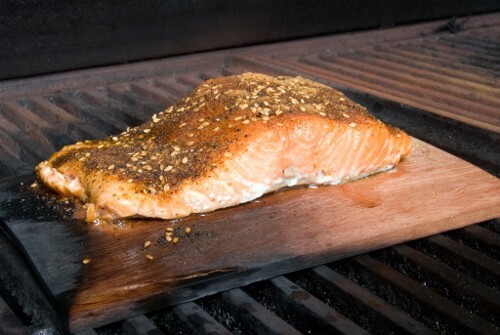 Using cedar planks while you are grilling foods, especially foods like fish, adds a new, delicious flavor to your meal. Cedar planks allow you to create an entire meal with your grill and are very easy to learn to use. Before you use your new cedar planks, you will need to soak them overnight, or at least a few hours, to prevent the wood from burning while in use. You can place them in a sink and cover with water or in a five gallon bucket with a lid. If you put them in a sink, you may have to put weight on them to keep them under the water. To add a different flavor to your food, try adding juice or wine to the water you are soaking your planks in. The flames will add the flavor of the juice to your foods. By choosing different types of wood, different juices and herbs, you can completely change the flavor of the foods you are grilling. Experiment with different ideas to find the one you love the most. When you are using a cedar plank to grill, be sure to always preheat your grill before adding the plank and food. This will ensure that your food will cook thoroughly and not burn on the outside. Food that is on a cedar plank does not need to be turned like food on the grill grates. Leave the lid closed and only check on your meal every five minutes or so. Keep a spray bottle nearby in case you have flames that are too high. Because your cedar planks provide a solid, smooth surface, you can cook foods that may be more difficult to do on the grate of the grill. Fish is a favorite food to grill on planks because it falls apart easily as it cooks. Cut up vegetables or fruits to grill on the plank with the fish and your entire meal will be done. Citrus fruits are especially flavorful to use when grilling fish. Your cedar planks can be stored anywhere without special treatment. If you like to have your planks ready to use quickly, soak them overnight and then wrap in plastic and keep in the freezer. Although you will need to thaw them before use, this is quicker than having to soak them for hours each time you want to grill. Cedar planks would make a great gift for anyone who loves to grill and experiment with different herbs and flavorings to create new dishes. Anyone who enjoys collecting gadgets would also appreciate a cedar plank as a gift.